McMahon has lost none of the attributes that made him one of the most promising young performers of the past decade. Once best known as the lead vocalist and main composer of the bands Something Corporate and Jack's Mannequin, indie king Andrew McMahon has risen up under a solo moniker to critical and commercial success. Imbuing his upbeat pop with a trademark warmth and optimism, his blend of synths and electronic soundscapes is coupled with razor-sharp on-the-nose phrasing and definitive pop moments. For 2018, Andrew McMahon brings his fans a special acoustic tour, The Pen and The Piano Tour. When it comes to his live shows, McMahon pulls no punches, giving them the same boundless energy that can be found in his songs. He's dynamic performer who climbs onto speakers, regularly rises from his piano chair and throws himself into the audience to crowd surf. This vigour, coupled with his songs' raw and emotional honesty makes for an arresting performance. Seen Andrew McMahon? Loved it? Hated it? Help your fellow Niagara Falls Theatre visitors by leaving the first review! Sound good to you? 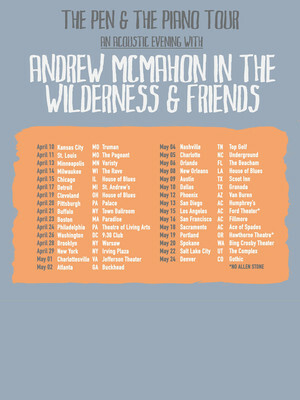 Share this page on social media and let your friends know about Andrew McMahon at Rapids Theatre. Please note: All prices are listed in US Dollars (USD). 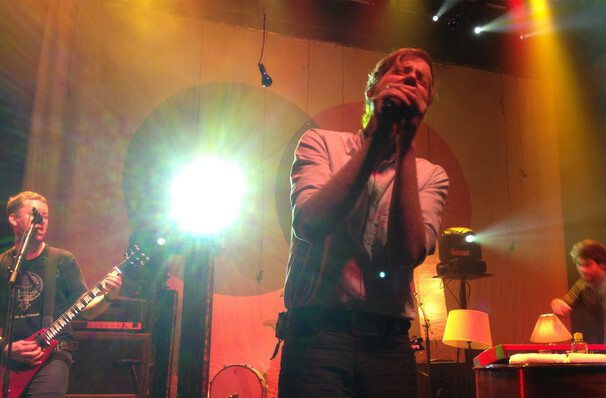 The term Rapids Theatre and/or Andrew McMahon as well as all associated graphics, logos, and/or other trademarks, tradenames or copyrights are the property of the Rapids Theatre and/or Andrew McMahon and are used herein for factual descriptive purposes only. We are in no way associated with or authorized by the Rapids Theatre and/or Andrew McMahon and neither that entity nor any of its affiliates have licensed or endorsed us to sell tickets, goods and or services in conjunction with their events.